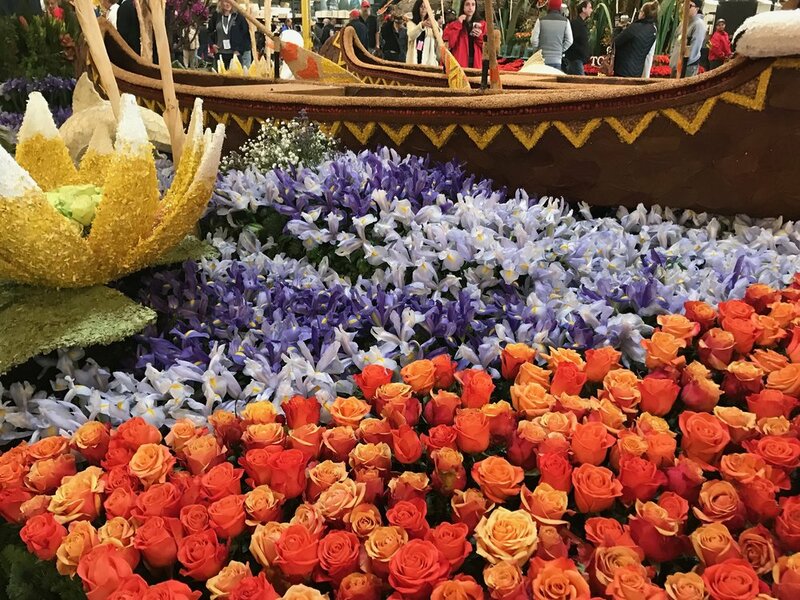 The theme for the Rose Parade this year is “The Melody of Life” and every year it seems to be very fitting and reflects the real-life effort and the synchronized effort by the entire company to pull the massive project off year after year for generations. I have been able to visit almost all our clients and the floats all look great and we should all be proud of job we have done for our clients. As you may know the project begins in the summer when we meet with our clients to view the float designs, discuss colors and availability of product. 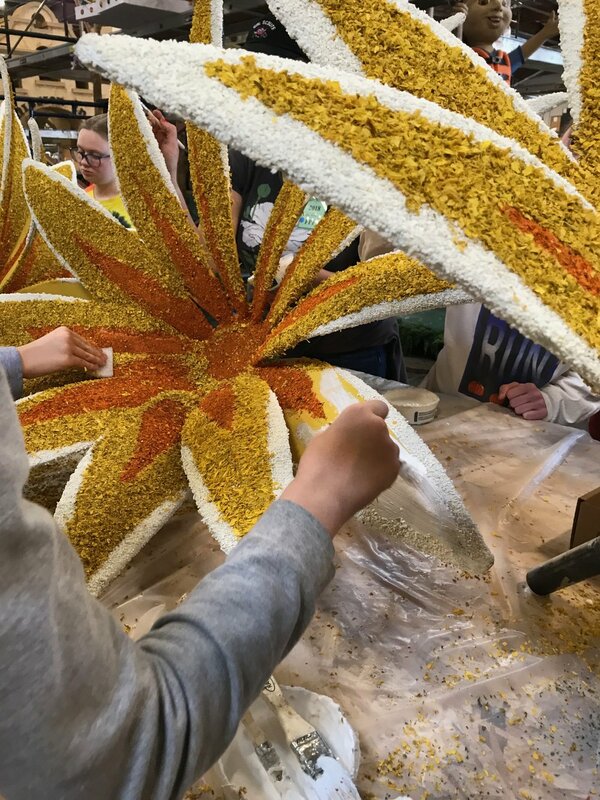 We started delivering sinuata statice and marigolds in October which is chopped up and dried to later be applied to the floats. This year there was a record amount of sinuate statice used which was procured from California, Mexico, Ecuador, Columbia and this year Kenya as well. As we made weekly deliveries of statice throughout the fall we also received or first floral order in November. Tannas Martin gathered all the orders one by one and entered every item into a shared Google document which could be seen by the entire procurement team all at one time. The management of the orders is not easy and Tannas seems to make it look simple each year. She also creates every sales order and ultimately each label which is placed on the buckets for each item. As the orders are compiled the procurement team begins the process of organizing the needs for each item and coordinate the flow of the product to the Los Angeles facility. Please keep in mind this is all going on while the operation is conducting business during the Christmas holiday season which is the busiest time of the year for the LA team. Debbie Mitchell no only coordinated the truck loads of Christmas greens she also insured the purchasing was smooth for all the farm product and many other items. 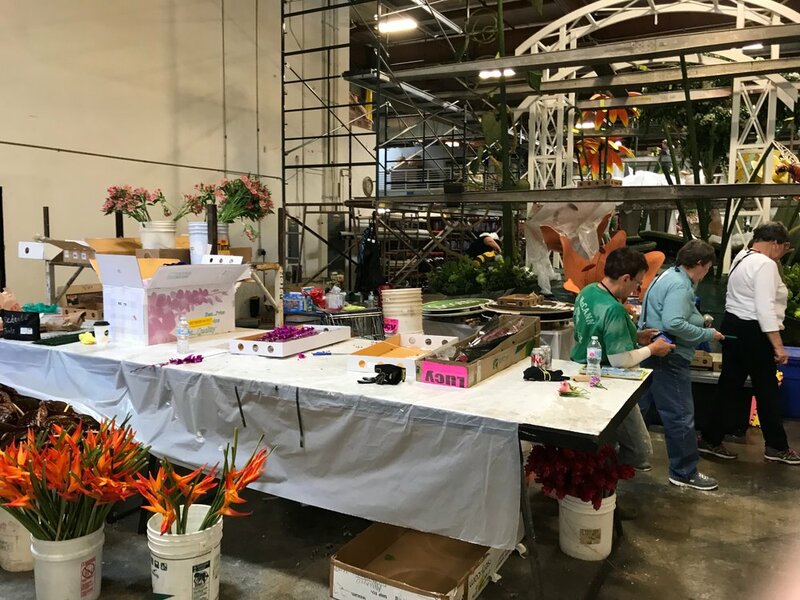 The orchids, lilies and iris are all key items and Jin Lee procured these items and with the help of Tannas insured the orchids where labeled properly for each area of the floats. In Ecuador Mario Veloz stayed on top on the flowers coming from South America. There are a lot of moving parts and a huge number of flowers and greens. This year we distributed almost 750,000 stems of flowers and greens in less than a week. As mentioned it was a true team effort. 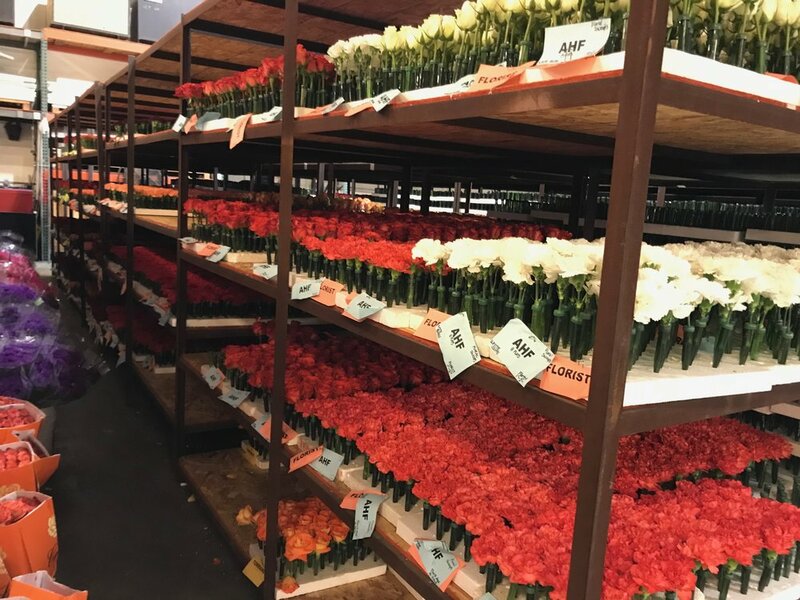 Thanks to Santiago and Misty at the farm for coordinating the use of over 150 carts as well as the semi-truck and driver to assist in the deliveries of the flowers. 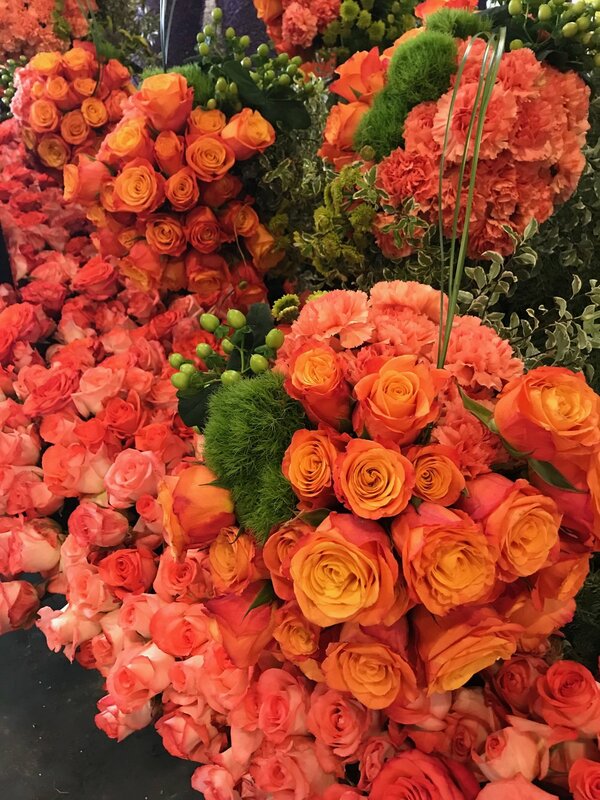 We were fortunate to have their help as flowers were processed in LA the carts of flowers we shipped back to the farm to be stored in their cooler which would later be delivered to our clients. The number of flowers is almost overwhelming and on one day we received over 1500 boxes of flowers from South America which were delivered on two trucks. Francisco Sanchez did a great job coordinating and keeping control of the inbound and outbound flow of all the orders. He developed a numbering system for every cart that went out the door and through efforts or Jose Gutierrez which made sure all orders where pulled properly and buckets labeled correctly we could track any discrepancy which led a very smooth delivery system. Maria Navarrete insured every order accounted for and that our clients received all the items they needed to complete their floats. She handled all back orders as well as added the cart numbers to every order that shipped for the tracking purposes. In years past we had many issues with unaccounted for product after the items were delivered to our clients. 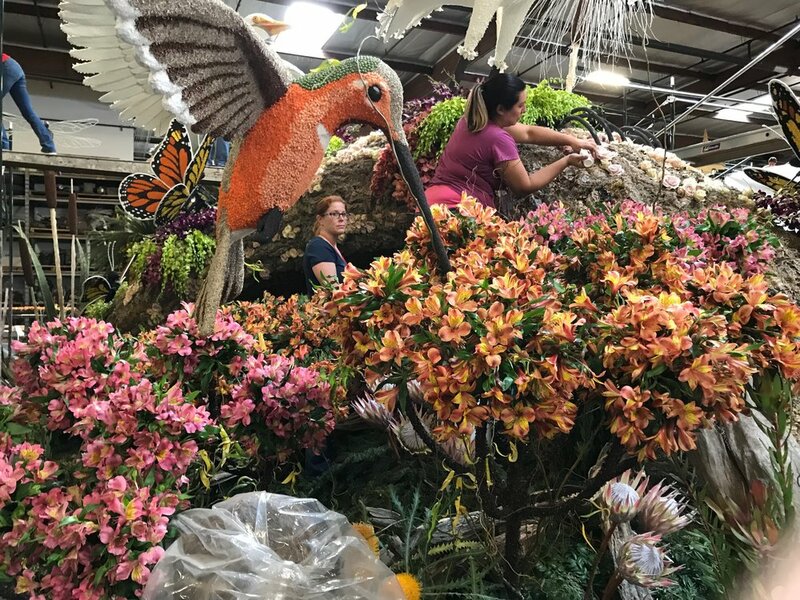 This year we were fortunate to place Melissa Pizzamiglio on site at Fiesta Parade Floats to insure the receiving process was smooth. It was a godsend to have her there to point out the items as they arrived as well debunk when the was a discrepancy. All the changes we made this year led to the smoothest delivery of flowers throughout the week which started in Dec 23rd that we completed the deliveries 24 hours in advance and our clients all acknowledged it was the smoothest year ever. While the crew pulled and packed all float orders, that meant the afternoon crew led by Melissa Aguilera had to pick up the extra load for our weekly clients which allowed our service to continue seamlessly which is extremely important. The float business goes back three generations for our company and we have seen lots of changes. One of the things you will recognize is a change in the designing of the floats. Some of the changes are prompted by rule changes which allow less fresh floral usage (but still organic items), other changes by clients needs. You will also see a change to the retro designing and larger usage of carnations and mums than in the years past. Not only has the designing gone retro so has our service. My first memories of the business were the Rose Parade and I can remember being at a New Year’s Eve Party as child at my grandmother’s house when my dad piled me, Jim and Mike into the car and we speed off to the flower market to load green and flowers into a truck. We were escorted by a police caravan at midnight to a client who had a tragic collapse of an arch that needed to be rebuilt. Well thankfully we have not had to do that again; however, I did get a 10pm call on the 29th while at Fiesta Float from Burbank Float Association and Cal Poly who both needed more flowers. Fiesta also needed more green buttons so my wife (Mary) and I drove to the market and loaded flowers into trucks for both as they speed away to complete their floats. We then proceeded to hydrate the mums on our chopping machine (conveyer) where Mary said she felt like Lucy on the I love Lucy episode at the chocolate factory when we could not keep up with the belt…LOL. 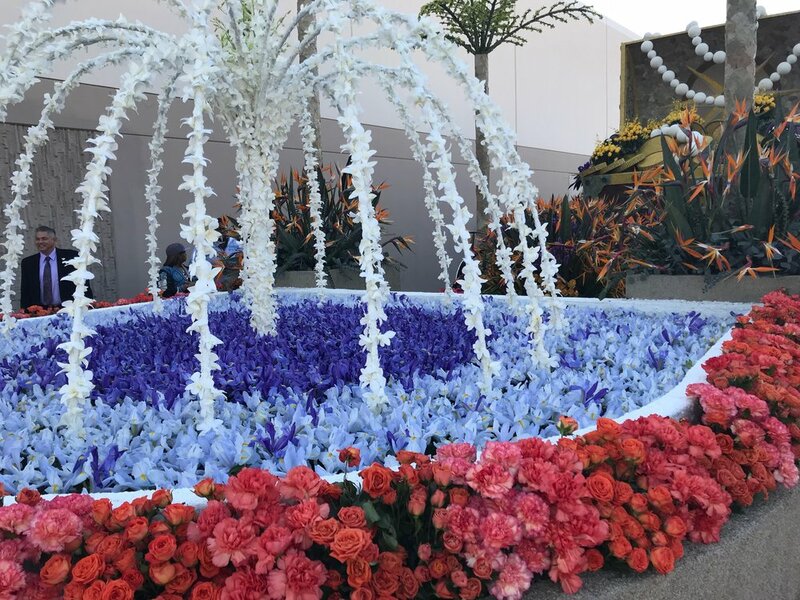 In addition, we provided flowers for five other Rose Parade projects, Live on Green, Sip and Savor, The Norton Simon Museum sign and the police motorcade. I am very proud of everyone who made this past week happen. I don’t know what giving birth feels like, but I believe the Rose Parade weeks is a bit like having a baby. It’s extremely painful while you are doing it, completely satisfying afterwards and for some reason you don’t remember what it felt like when the next time it comes around.